Tonight, or any one of these long December nights, you can find the constellation Auriga the Charioteer. The Heavenly Chariot – with its brilliant yellow star Capella – starts the journey in the northeast at early evening, flies overhead around midnight and finishes up in the northwest at dawn. 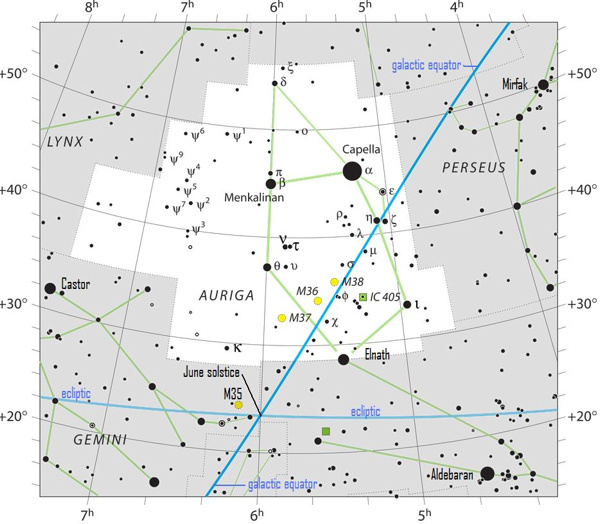 Our chart shows Auriga at the vicinity of midnight, when this pentagon-shaped pattern hits the zenith, or highest point in the sky. 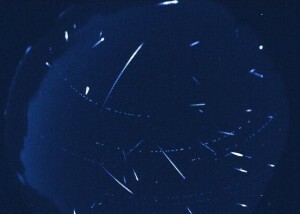 From the Northern Hemisphere, however, you can actually see Capella and the Celestial Chariot in the northeast sky at nightfall. 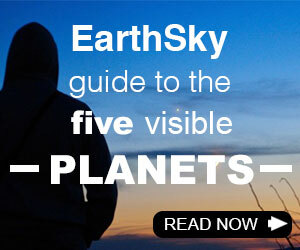 EarthSky’s lunar calendar is the perfect gift for any sky lover! Order now – they’re going fast! The constellation Auriga. 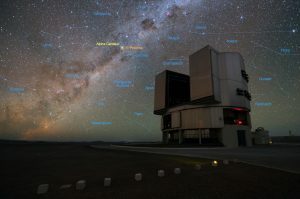 The ecliptic and galactic equator intersect near the June solstice point. 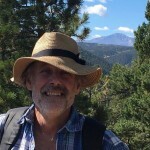 Click here for a larger chart. As seen from either the Northern or Southern Hemisphere, the constellations Auriga and Orion always climb highest for the night in concert. If you live at middle and far northern latitudes, you’ll see Auriga above Orion. If you live in the Southern Hemisphere, you’ll see Auriga below Orion. Either way, Auriga shines to the north of Orion the Giant Hunter. There are several easy-to-find and famous star clusters in Auriga. With binoculars, you might be able to spot them. They’re known by their “M” numbers – named for the famous astronomer Charles Messier – M36, M37 and M38. To the south of these star clusters, also close to the galactic equator, look for M35 in the constellation Gemini the Twins, at the foot of Castor, the mortal twin. Now turn your focus to Capella, the brightest star in Auriga. According to star lore, Capella represents Amalthea, the she-goat that fed the infant Zeus when he was hidden away in a cave on Mt. Ida in Crete. This was during the war between the Olympian and the Titan gods. Of course, the river of milk that spilled from Amalthea the she-goat formed the Milky Way! 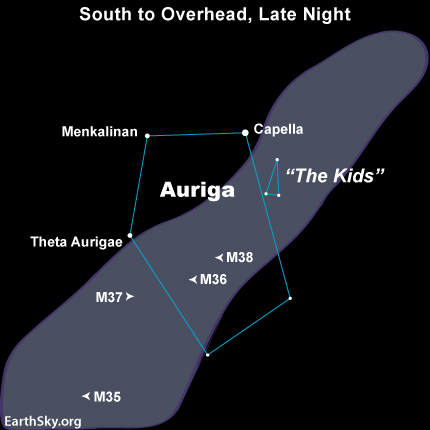 Auriga’s stars Menkalinan and Theta Aurigae (see above sky charts) run north to south. They point northward to Polaris, the North Star, and south to Orion’s bright ruddy star Betelgeuse. With binoculars, check out the star cluster M35 between Theta Aurigae and Betelgeuse. Bottom line: On these long December nights, you can find the constellation Auriga the Charioteer. There are several easy-to-find and very famous star clusters in Auriga.